We were three ladies and two gentlemen. All of the ladies true experts in cooking, both men kind of beginners. A drawing decided who would be responsible for starter, main course and dessert. In my opinion a good way for making groups without much discussion. Me and my fellow blogger Martin were responsible for the starter. While Martin prepared the rösti I ‘hammered’ and chopped the tatar. Well, that was easy. Some more difficult tasks like slicing tomatoes in a certain way followed. As chef Ferdinand and his assistant Ana were always willing to give a hand we mastered even the most complicated tasks. Besides that we had much fun by talking about the ingredients and how to scope with them. In the talks there was also a focus on regional food, most of the ingredients were bought at a farmers market just next to the door of the restaurant. 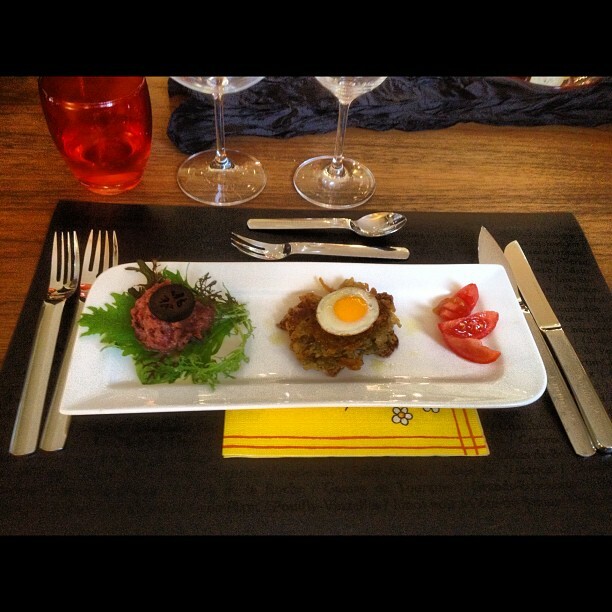 And that’s the result: “Ladies and Gentleman, as entrée chef Martin and me would like to serve deer tatar with rösti and fried quail egg. 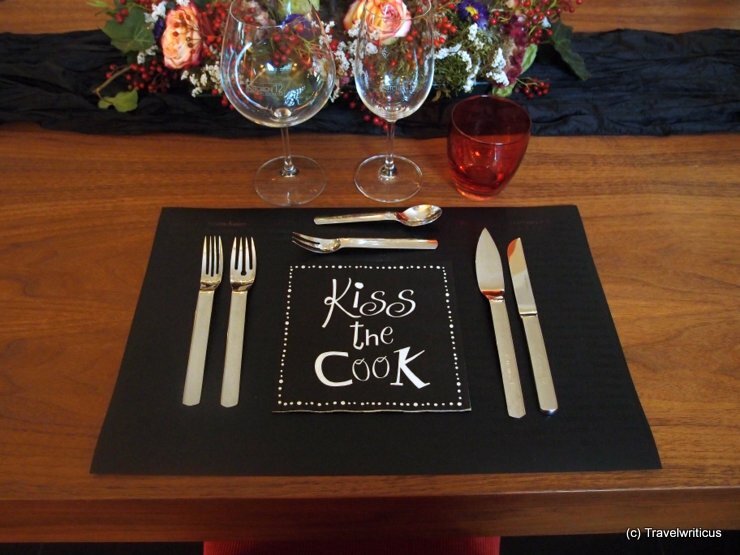 Bon appétit!” – Of course Ferdinand did not only tell us how to cook but also how to serve the courses. How did I like it? I was very impressed by the main course which was a trout served with a hokkaido pumpkin risotto. My tatar was okay. The presentation of the dishes was excellent. A big thank you to Ferdinand and Ana who helped us to be so creative. 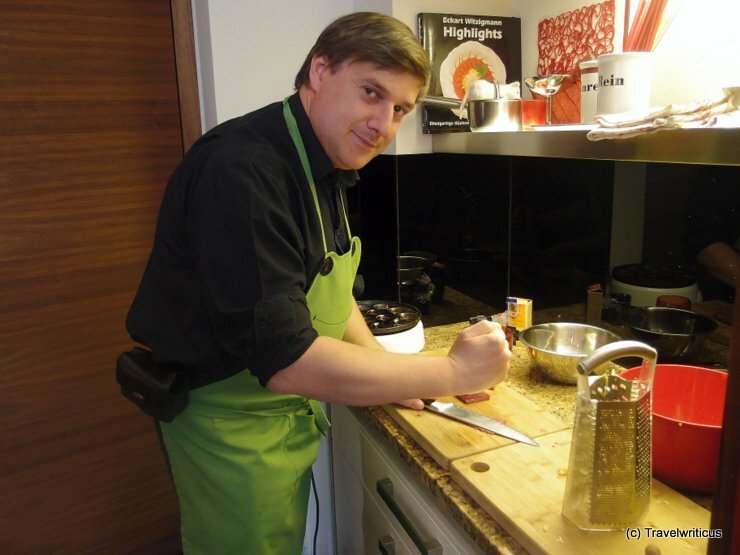 This entry was posted in Cuisine and tagged Austria, Graz, Styria by Travelwriticus. Bookmark the permalink.